For the past few decades, major medical advances have seemed to come from internal medicine—things like drugs, therapies, detection and prevention. Surgery still, for the most part, seems like the quasi-barbaric practice folks like Bones on Star Trek used to make fun of the 20th century for. With the exception of laprascopic and other forms of minimally invasive surgery, things have seemed, at least from the outside, to have stood relatively still. But that is showing signs of changing. 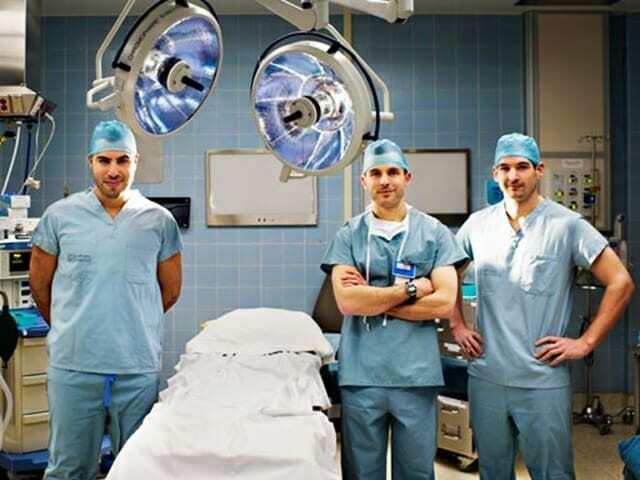 Three southern Ontario startups, all working in conjunction in one way or another with MaRS, have developed new and often quite simple tools to help surgeons improve their game, and in some instances even change it. Speaking with principals at the companies, it can be striking just how basic some of the problems with surgery still are. It was a problem his father, an orthopaedic surgeon in upstate New York, proposed to him when he was at the University of Waterloo and about to embark on his fourth-year design project for his mechatronic engineering degree in 2008. Though Bakirtzian and his three friends who collaborated on the project didn’t think of themselves as entrepreneurs, they tinkered with their design for work station that consists of a laptop and disposable sensors that can make measurements with the 1mm and 2mm tolerances surgeons were making with things like simple measuring tape for the next couple of years, and in 2010, they got a big entrepreneurial bump when they won Ontario’s Next Top Young Entrepreneur competition. “That really gave us the confidence and connections to other orthopaedic surgeons to go ahead full-time,” he says. Intellijoint team in the OR. Their main focus, at least to begin with, is hip replacement surgery. Bakirtzian says that a recent study revealed that 62 per cent of patients experience leg lengthening as a result of slightly or grossly mis-measured hip replacements, sometimes necessitating further surgery, and often causing great discomfort, inconvenience, even pain. After getting both Health Canada and FDA approval, their system — which adds roughly three minutes to a surgery — has been used in about 150 procedures in Canada and the US. 7D Surgical CEO Beau Standish, an engineer with a Ph.D. in Medical Biophysics who taught at Ryerson for three years, describes his company’s new tech as a sort of 21st-century medical stud-finder. And for anyone who’s seen surgery, either in real life, or on a documentary, the analogy is not that far off: Just as in carpentry, one wants to measure twice and cut once. The only difference is the stakes are much higher. Standish says his company’s device is a surgical navigation system, helping doctors to achieve pinpoint accuracy in delicate procedures that absolutely require it. He says that though of course doctors are trained to do this, scoliotic spines, or spines that have been in a traumatic accident can look quite a bit different from the spines they have trained on. They also present challenges that are difficult to anticipate, and could end up taking quite a bit of precious surgical time to resolve. “We’re providing additional confidence to aid in the placement of the spinal screws,” Standish says. Working with Dr. Victor Yang’s Biophotonics and Bioengineering Laboratory at Ryerson University, the latest surgical navigation prototype, which includes both hardware and software, has been used in 40 procedures at the Sunnybrook Health Sciences Centre. An FDA and Health Canada approved version from 7D Surgical will be available soon. 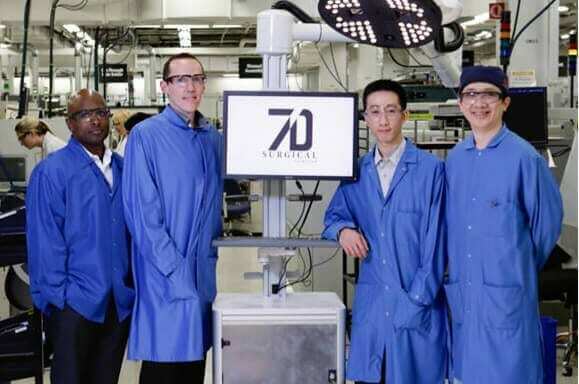 7D Surgical founders at their manufacturing space at Celestica in Toronto. So Toronto-based Gestsure’s technology allows surgeons to use Kinect in Minority Report fashion, controlling screens and, ultimately, perhaps hardware as well, with perfectly sterile gestures in the air, saving both time and potential infection vectors. They’ve received FDA approval in the US, and Health Canada has decided they’re not a medical system and so can proceed without oversight from them. But maybe the best part so far has been the few seconds of multi-million-dollar airtime they got as part of Microsoft’s Super Bowl commercial earlier this year, with what Fan calls an “extended vignette” in Microsoft’s online version of the ad. So far, they’ve sold several systems in Canada and the US, and one in Doha, Qatar, where Gestsure’s chief technology officer, Greg Brigley who, like the rest of the team — as well as the founding team behind Intellijoint — went to the University of Waterloo, is currently doing the installation and training. This burst of innovation, assisted by MaRS and much of it born out of the tech hub BlackBerry, bodes well for surgery’s future development, and Canada’s role in it.